The Crested Butte/Gunnison trails map app (CBGTrails) Winter map update features a multi-user map of all winter trails (USFS winter zones, Nordic, CBMR, and Fatbiking) in the Gunnison Valley. The CBGTrails Winter Map was created to provide locals and visitors with winter trail maps on mobile phones that work offline. Be sure to download offline maps on your phone before leaving cell signal to so you can see your location in the map in areas without a cell signal. 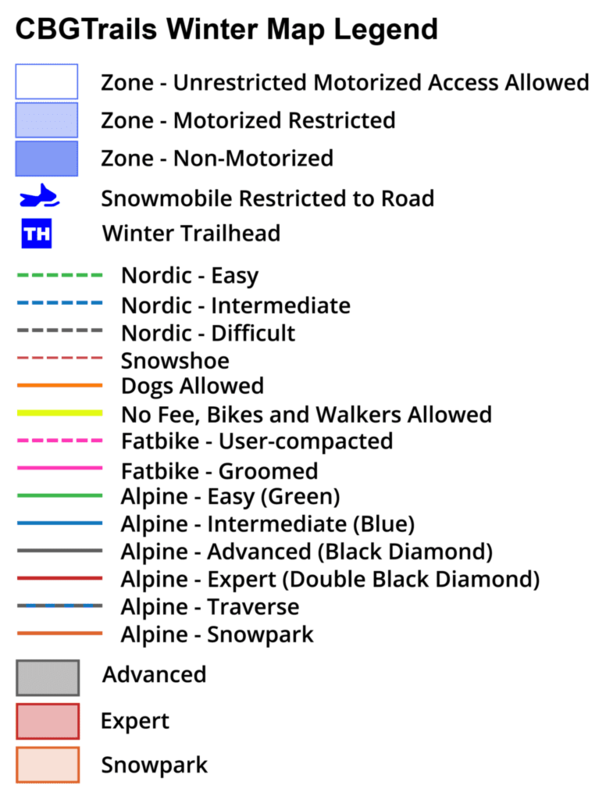 The map shows the types of winter travel access that is permitted in USFS Winter Zones and on Trails. The Winter Map update is live in the CBGTrails app at the Apple App Store and Google Play store as well as the below. Go to the app stores and search for “CBGTrails”. For details see the USFS Winter Recreation Around Crested Butte Brochure. Promoting positivity and cooperation on the trails. Respect private property and other closures. Be polite and respectful of all other users. Stick to areas open to your specific use. Pet-owners, clean up dog waste at all times and keep dogs under control. On established trails, respective users should stick to their own lanes. Skiers and snowshoers step aside to let fat bikers and snowmobiles pass, making sure to move any pets out of the way. Fat bikers and snowmobiles slow down and move over to the side while passing. Be aware of blind corners. Stick to your lane or the correct side of the trail. Fat bikers make sure to use tires 3.8 inches it wider, with a pressure of 10 psi or less, and made sure tires are wiped clean of dirt before riding on snow. Check avalanche and other weather forecasts. Go to kbyg.org or cbavalanchecenter.org. Always have a buddy and a beacon when traveling in avalanche terrain. Let others know your schedule and where you’re headed. Be sure to pack adequate food, water, and clothing. Thank you to our Winter Map data partners!